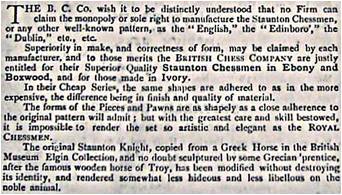 Royal chessmen, Rd 177079 in the 1891 catalogue. a shorter dressage mane had been introduced and the set was called just the Staunton. chess activities continuing for a few more years. extremely rare top grade sets where hand carved knights could be bought as an upgrade. 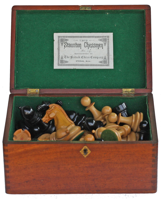 They even made complete sets from Xylonite and, very rarely, in ivory to the same styles. always have crowns and four crenellations to the rook. delighted in attacking the Jaques knights. Broadside on Jaques published in 1893. Pure calumny about the Jaques knights � what venom! by S, for superior for the better finished sets. The S is frequently mistaken as being a 5. 10s. The equivalent Jaques sets were 12s-6d to 45s. By 1901, only sizes 3-6 were advertised. 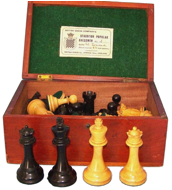 Early Royal chessmen. Collage to scale, assembled from individual photos provided by Tim Millard. 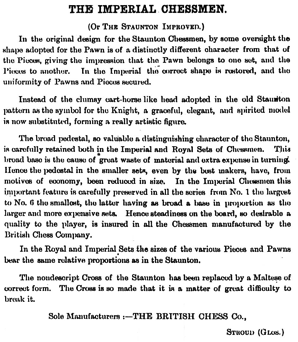 Later Royal chessmen, stockier, with thicker rings. they had deteriorated from the early high standards. difficulty initially in matching the boxwood colour in Xylonite. Large club size No. 1S. Comparison of hand-carved white 1S knight and 3S Xylonite. strength or to match the other double rings. Double collared pawn of 3.3� size 4S (Courtesy Tim Millard). distinctly superior and harks back to the very early Jaques knights. BCC is exceptionally stable and well finished. BCC bishop on left, Jaques 1890s on right. taller than the knight and. (Figure 86). The knight is carved and not Xylonite. and the bishops revert to old English styles. 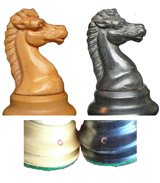 �New� Imperial chessmen, with carved knight. Pawn double collared. Imperial chessmen, with Xylonite knight (Crumiller collection). Note the Eastern tear drop finial to the king, and not a cross. for some reason, probably because they were bought in. rooks have 5 crenellations. Other styles were marketed in the �Popular� series. Rooks with five crenellations. They and the knights still stamped in the usual way.